Flowers are the plant’s reproductive structures. Angiosperms are types of plants that bear fruits and flowers. Flowers are usually both male and female, and are brightly colored to attract insects to help them carry pollen used for sexual reproduction. Not all flowers are colorful, though. These flowers usually use the wind for pollination. The receptacle is the part of the branch on which a flower forms. Color the receptacle (B) brown. Sepals are leaf like structures that surround and protect the flower before it blooms. Color the sepals (C) green. Petals are the colorful part of the flower that attracts insects and even other small animals, such as mice, birds, and bats. Color the petals (D) a bright color of your choice. All flowering plants have flowers, but some are not brightly colored. The petals of these flowers are reduced or absent and the plant relies on the wind or water for pollination. The flower has both male and female reproductive parts. The female reproductive structures are called carpels. In most flowers, the carpels are fused together to form a pistil. Color the pistil (P) pink. 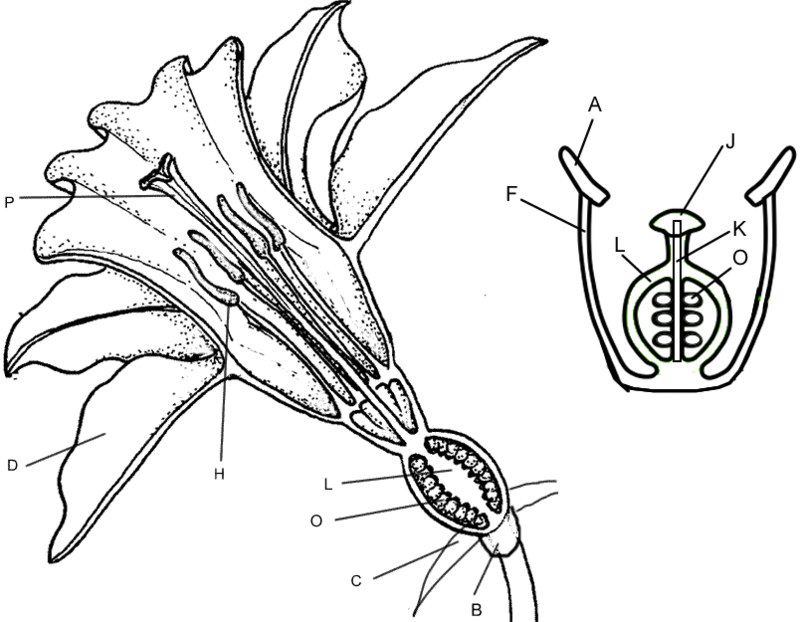 The pistil has three parts, which can be seen, in the box labeled “pistil”. The stigma at the top is often sticky and is where the pollen attaches. Color the stigma (J) purple. The style is the long tube that attaches the stigma to the ovary. Sperm from the pollen will travel down this tube to the ovules. The ovules, or eggs, are stored in the ovary until they are fertilized. Plants can only fertilize eggs of the same species. Special chemicals prevent sperm from fertilizing the eggs of flowers that are not the same kind. Color the style (K) red, and the ovary (L) pink. Color the ovules (O) black. The male reproductive structures are called the stamens. Color the stamens (H) blue. Each stamen consists of an anther (A), which produces pollen, and a filament (F), which supports the anther. In the box labeled “stamen” color the anther dark blue, and the filament light blue. Pollen produced by the anther is carried by insects or other animals to the pistil of another flower where it may fertilize the eggs. Sexual reproduction in plants occurs when the pollen from an anther is transferred to the stigma. Plants can fertilize themselves: called self-fertilization. Self-fertilization occurs when the pollen from an anther fertilizes the eggs on the same flower. Cross-fertilization occurs when the pollen is transferred to the stigma of an entirely different plant. When the ovules are fertilized, they will develop into seeds. The petals of the flower fall off leaving only the ovary behind, which will develop into a fruit. There are many different kinds of fruits, including apples and oranges and peaches. A fruit is any structure that encloses and protects a seed, so fruits are also “helicopters” and acorns, and bean pods. When you eat a fruit, you are actually eating the ovary of the flower. 1. What is an angiosperm? 2. The flower attaches to what part of the plant? 3. Why are flowers brightly colored? 4. Name two mammals that might pollinate a plant. 5. If the petals of a flower are reduced or absent, how is the plant pollinated? 8. Where are the ovules stored? 10. Describe sexual reproduction in plants. 11. The ovary develops into what structure? 13. Some flowers are not brightly colored at all, but have a very pungent odor that smells like rotting meat. How do you think these flowers are pollinated? 14. In many flowers, the pistils and stamens reach maturity at different times. Considering what you know about pollination, why would this be an advantage to the plant?